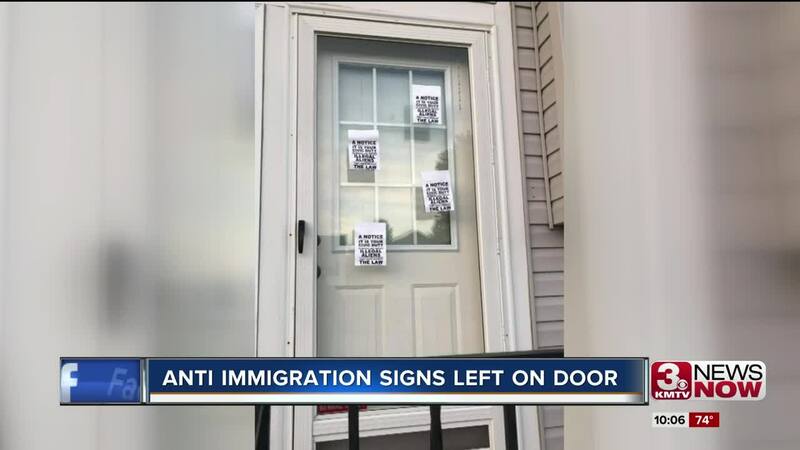 A Sarpy County man arrived home from work Friday morning to find four fliers taped the front door of his home near 179th and Olive Street. The posters were covered with bold print calling for people to report anyone they believe to be in the U.S without documentation. The papers also list phone numbers for ICE and DHS. Jaime Balbuena believe the papers are targeting his family. "From what I know of - I am the only Hispanic in this block. And nobody else had these posters on their doors, it was only my house," said Balbuena. "I think it's pretty sad, especially when it comes to asking other people to report somebody, just because you think somebody is an illegal immigrant. You can't tell who is illegal just based on somebody's ethnicity." Balbuena reported the incident to police. He doesn't know who could be responsible. "I feel if anybody in this neighborhood was the one that did it, I don't know if my kids are out here safe playing anymore," said Balbuena. "Are they going to target my kids or something while I am not looking?" Other flyers with the same statements have been appearing around the metro including in the Dundee neighborhood and in Papillion.